5 cm hand-made stud earrings with nickel-free silver wire, two Peruvian ceramic beads (hand-painted) of 1 cm blue and black color and 4 mm beads of Obsidian eye celestial. The hooks of earrings I can change them for hooks for unperforated ear, also if you want the hooks for ear pierced silver I have them for sale on my shop of "A little haberdashery" Que-Cuuchi If you want me to change them, you must notify me at the time of purchase in "contact the seller". 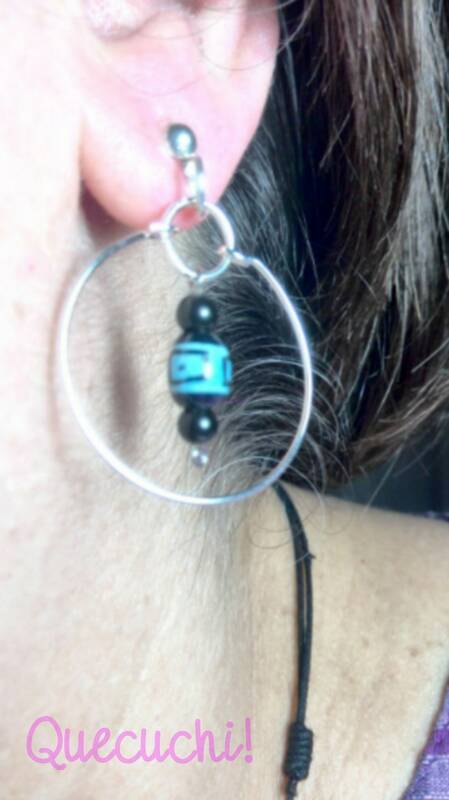 Earrings with three Obsidian beads. Bracelet with Lava and black Obsidian beads. Chain Necklace Obsidian Celestial Eye. Long necklace, 90 cm on Obsidian snowflake chips with double clasp. 70 stone chips of Obsidian Snowflake.